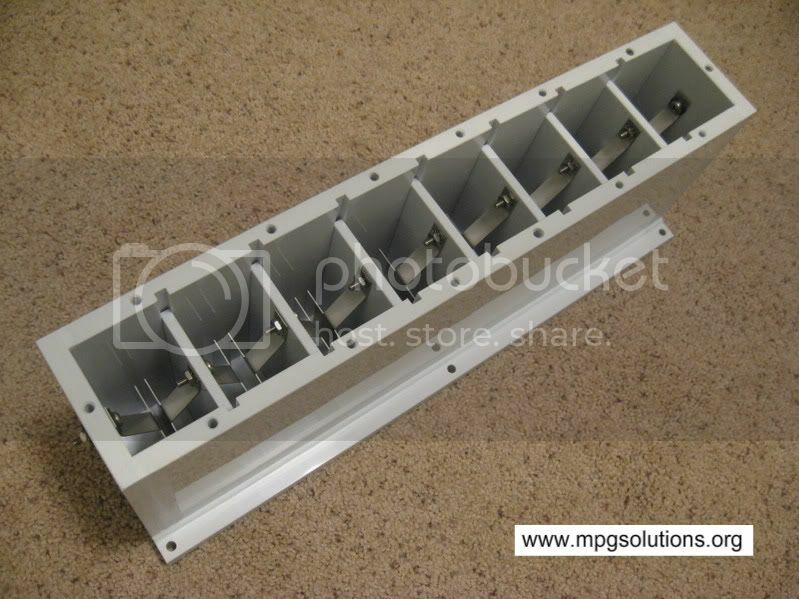 From reading I think this is the best design, I have a question concerning it tho, what should the spacing between the plates be? And the little hole to maintain water level is suppose to be 1/8" right? Also if I made 2 separate boxes and wired them in parallel would the gains be better at the same amperage compared to just 1? Why not make 2 separate boxes with half as many neutral plates and wire them in series? Most people specify 1/8 inch spacing to allow the bubbles to pass between the plates. The water holes should be staggered so they don't line up, so one at left, next one on the right, then next on the left again so electricity has a longer path to pass through the cell. would the spacing be ok if it were a little more? such as 3/8"? also, Ive heard 7 cells it the best because you get 2volts per cell, at 14volts, but sometimes my voltage drops to 13.4-13.5 for some periods of time, would the 7 cell still be ok or would the voltage drop too low? I am still having a hard time understanding what the definition of a "true series cell". I understand enough to know that it is multiple sets of electrodes hooked up in series. 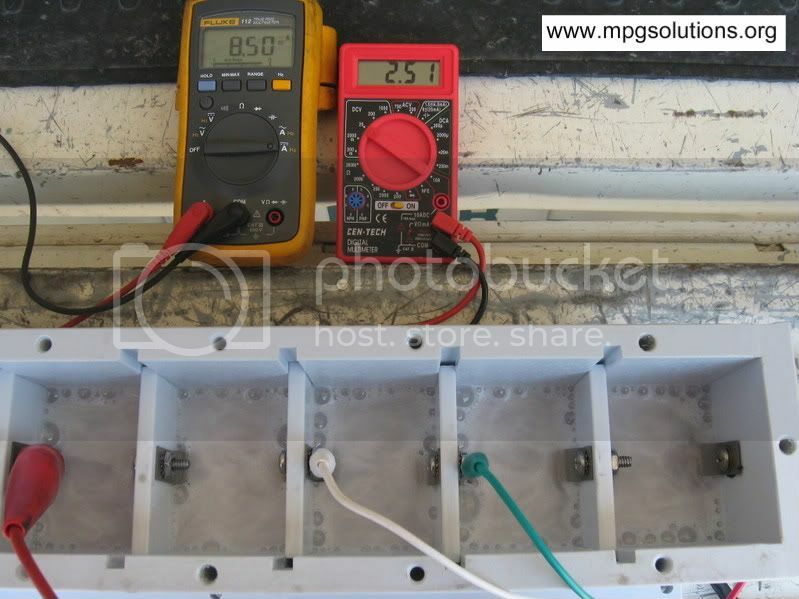 I am building a series cell that has 7 sets of electrodes in a common bath as opposed to each having a seperate container for each set of electrlyzers. Is this a true series cell? Also, if I wrapped each set of electrolyzers with shrink wrap, would it help it be more efficient? this picture shows it pretty well, originally posted by qsiguy of this forum. Basically no common bath, just plates with water inbetween them no water going around them. I'm not sure if the shrink wrap would work, it might but keep in mind that the electrodes are in a very harsh environment that wouldn't likely work well with shrink wrap or something of that nature. I drew up the diagram above to help people understand what is meant by a series cell. In a common bath the current can still pass around the neutral plates, it's better than no neutral plates but not as efficient as the true series design. Here is one I'm building at the moment. This is another way to make a true series cell. The method is larger than the method above but does have it's benefits, cooler operation and more water capacity. Another member, hydrodine, has one of a similar design that is working very well. He claims 1.2 LPM @ 9 amps. I'll have some of my own test data shortly. Where did you get your container? I have a very eerily similar design myself. Just the thing I figured on. 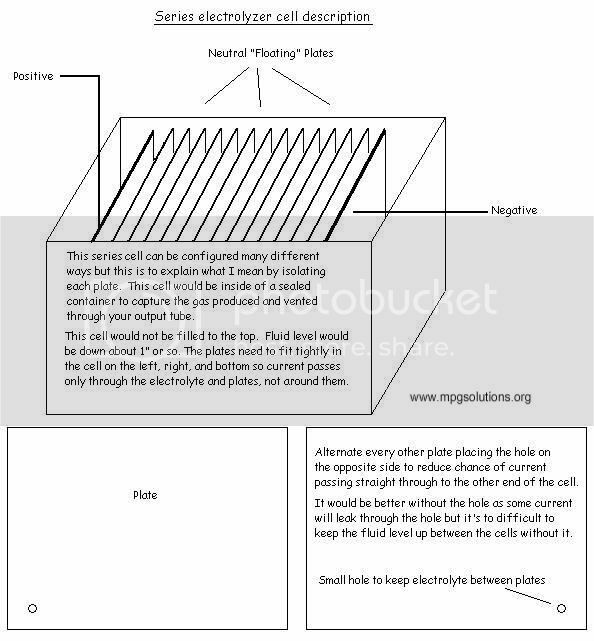 This would be another true series cell with zero leakage between cells (electrolyte or electrical) and the design would be more flexible in size and layout. I drew up the design on CAD and had it build by a plastics company I do business with. I did some initial testing yesterday and later today I will get the lit mounted and measure the gas output. I'm going to just run on 5 cells for now. 6 will work as well but the concentration of the electrolyte needed to be pretty high. Next version I will change the electrodes a bit and should be able to run on 6 cells. I did 8 to experiment but final product will have 5 or 6 cells. It ran great yesterday. On 5 cells It started at 8.5 amps 2.5 volts per cell. After about 30-40 minutes the temp came up a bit and it settled at about 9.5 amps and ran for about 3 hours. I put it out in the sun on the concrete to simulate extreme conditions. The concrete was 130*, ambient temps were around 105*. The water in the generator never exceeded 130* running at 9.5 amps. Had the top off for these tests so I don't have the gas output numbers yet. I've tried many chemicals for the electrolyte but for this one I found some "Instant Power Heavy Duty Drain Opener" at Walmart. It is a clear liquid, easy to mix, electrolyte stays clear. It contains Soduim Hydroxide and Potassium Hydroxide. You mix more than the normal amounts since it's in liquid form. I was running about 29% of this chemical, 69 oz distilled water w/ 20 oz. of the NaOH/KOH mix which was very stable for the 3 hours I ran it for. Adding the 6th cell with this same mix ran about 5.3 amps. lookin good man get us some numbers on how much that beast produces!